What can be bothering you, except the traffic, while you visit Scheveningen? Nothing, if you have breakfast, lunch or dinner at Restaurant World. Even in bad weather you’ll have fun here, comfortable sitting inside. International dishes are as much as possible prepared with local ingredients. There is also plenty of attention for local specialties, such as the ‘bomschuit’, the local Scheveningen beer. Keep an eye on the calendar regularly for musical events. Als u met de tram reist dan kunt u tram 9 of tram 1 nemen. Bij beide kunt u uitstappen bij de laatste halte, halte zwarte pad. Vanuit Den Haag het bord Scheveningen aanhouden. 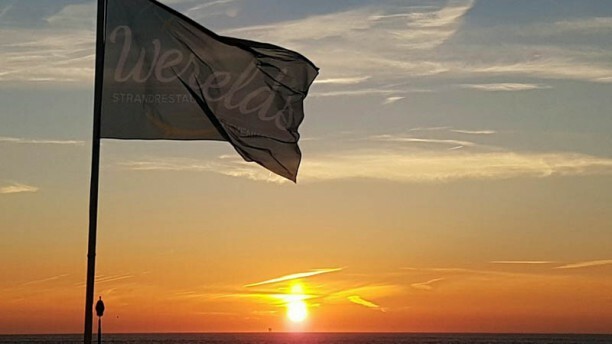 Bij Scheveningen-haven komt u aan de andere kant van de boulevard terecht. Nice service, friendly staff, good food. Overall a very pleasant dining experience! Had a fabulous meal with the Albert Heijn offer. Very friendly and good service. Beautiful evening on the beach which was a plus. Would recommend. Last saturday we celebrated mij daugthers birthday at Strandrestaurand Werelds. My daugther is vegan and the staff and manager went out of their way to serve snacks that she could also have. They where super service minded and nothing that we asked was too much. We had the best time. I could not of asked for more.